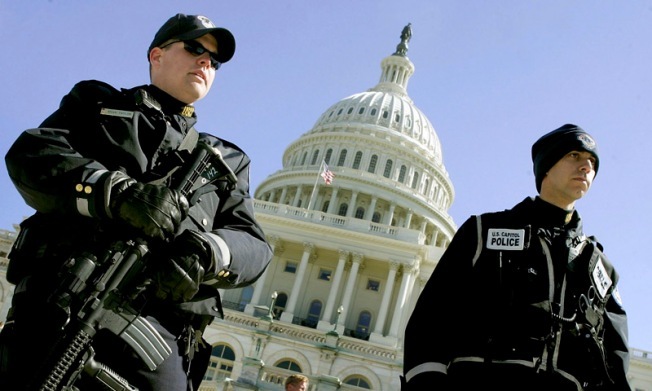 Members of the U.S. Capitol Police stand guard on the west front steps of the Capitol building. If you inaugurate him, they will come. And they will be safe, damnit. Those are just three ways Washington-area political leaders described the security plan announced for President-elect Barack Obama's inauguration. The idea is to make everyone, especially the new president of our country, safe on Inauguration Day. It's the government's duty, after all. But some feel the idea has been taken a bit too far. A wise man once said: "Those who would give up essential liberty to pursue safety deserve neither." That wise man? Benjamin Franklin. About 3.5 square miles of the District of Columbia will be closed to traffic on Inauguration Day in order to make it "secure" for Obama's event. Remember, the District is not that big. Do the math and authorities are shutting down 5.7 percent of the entire D.C. land mass. That's ... well, a lot. Shutting down portions of the District for high-profile events and people is not new. But what really has people in a tizzy this time around is the sheer mass of the closures. When officials first released their plan, they declared they were shutting down all bridges in the area between Virginia and D.C. Virginians would have had the option of packing like sardines onto Metro trains that would drop them off somewhere in the District, or walking several miles across a bridge. Not any of the bridges closed to traffic, just one. The rest would be closed. Officials later reversed this to say people were free to walk across any bridge (as long as they stayed on the sidewalks) or to ride a bike. Virginians aren't the only ones getting the short end of the inauguration stick. Maryland residents have to deal with road closures. And those who reside in the District also feel the pinch. Early on, the area transit system advised people up to two miles away from the Mall to forget taking their car. Forget the Metro. Just put on some comfortable shoes and walk. Once people finally make it to the Mall, their troubles won't be over yet. First, they have to get through security checkpoints. The list of items you can't have along the parade route or at the Capitol is longer than the line at a DMV on the weekend. After being herded like cattle through checkpoints and behind 5-foot-tall metal fences on the Mall, people then have a decision to make: Watch the swearing-in ceremony or watch the parade. Don't even think about doing both, people. That's the word from District Mayor Adrian Fenty, who said the crowds are going to be so big that, logistically speaking, seeing both is close to impossible. Speaking of fun, are we having any yet? The securocracy got so bad that one intrepid TV reporter asked officials if there was any thought of just canceling the whole gosh-darn parade and doing away with the antiquated tradition entirely. Not a bad question, considering the amount of money being spent to assure the public and the president's safety against dirty bombs, snipers ... and the homeless. Leaders quickly scoffed at the reporter's question, by the way. The show will go on. And what a show it will be. The latest estimates say about 2 or 3 million people are expected to show up for the inauguration. And they will be safe. But one has to wonder what freedom is being taken away to make sure safety is achieved.